Thread is thread, isn’t it? 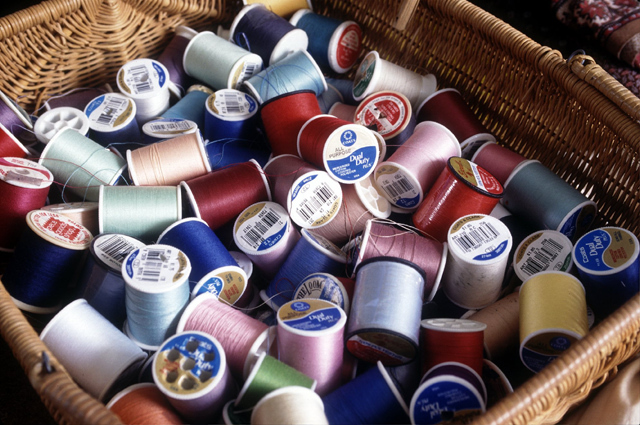 How choosy are you when it comes to thread? Or does price drive your decisions? Here’s a fun .pdf graphic of the different types of threads from Nancy’s Notions and Madiera threads. To download the .pdf to keep in your sewing room or to save to your smartphone or tablet for the next time you go shopping, click the graphic below. How big is your thread bin? Does it grow with every new project because you don’t have the exact shade or that you run out just as you’re only left with the last 20″ of seam or hem, which then you have to run to the fabric store and buy another whole spool of vibrant orange to match, which you might never use again? Then there’s the whole idea of your top fabric is a different dominant color than your bottom, so you have to buy two different spools of color. Well, wouldn’t it be nice if you could just simplify? I’m not talking about just using white, black or an invisible thread. Or what if you could have an endless supply of thread that wouldn’t take up more storage. Every shade you could imagine. How wonderful would that be? Well, short of working for Gutterman, Coats & Clark and having a dedicated wall of thread, it’s a dream for most of us. But what if your machine just knew the right color? Nice, huh? Check out this concept machine from designers Monika Jakubek and Anna Müller that will match your thread to any swatch of fabric. According to SewReview.com‘s review, the guess is it’s like matching custom colors at the paint store. The swatch is scanned and interpreted by the internal technology, then ink tanks colorize the originally-white spool of thread as you sew, similar to how your inkjet printer shoots CYMK (cyan, yellow, magenta, black) ink colors onto paper to create color. How cool is that! Also very cool on this concept sewing machine is that the stitch pattern is projected onto the fabric as you sew. The concept machine is also designed with an easy access to stitch selection, length and width. With a nearly 360-degree open arm space, there’s plenty of room to move fabric around. The arm design reminds me of a long-arm where the sewist would be positioned in front of the machine. No worries about a free-arm; it looks like the bottom panel flips off to give a very open free-arm allowing for very small turns…think how much easier it would be when sewing children’s clothing or doll clothes for the little ones! The designers have even thought about the foot pedal. It took me a while to understand this, but the reverse is on the foot pedal. It might take some getting used to, but once you do get used to it, think how much time is saved. The concept for this sewing machine was to make it visually user-friendly and to motivate new and returning sewists with its elimination of time-consuming tasks. This concept sewing machine has already won several design awards: Lucky Strike Junior Design Award Recognition, Recognition of the Mia Seeger Stiftung and IF concept award 2010 2nd place. What do you think about this concept machine? Leave a comment or tweet us and let us know.